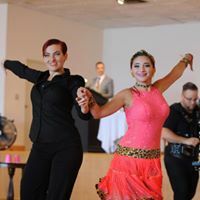 Arthur Murray Dance Centers are Connecticut's premier location for ballroom dance lessons! At Arthur Murray Dance Centers, if your middle name isn't fancy feet then you have come to the right place! With a legacy of more than 100 years, we have extensively developed the Arthur Murray teaching method and through individual lessons, group classes and many opportunities to practice, you can trust that you have chosen the best in the business. With locations in Bloomfield, Danbury, Glastonbury, Greenwich, Guilford, Hamden, Niantic, Vernon and West Farms, you can easily find a location near you. We offer instruction in just about every dance under the sun, including waltz, rumba, cha-cha, swing, salsa, tango and many, many more! Take a look around our site and send us a note or give us a ring so you can walk on in...and then dance on out!